Water parks in Malaga: Slides full of fun! The three water parks on the Costa del Sol have become, over the years, an indispensable attraction included in the province’s tourist offer, specially during the hotter months. To get away from those packed and often dirty beaches with filthy sand and water, these places continue to offer the visitors a park full of fun and entertainment, with vertiginously steep slides, in which the adrenaline rushes through your whole body. So, the three water parks in Malaga province are: the Aquavelis in Torre del Mar, in Velez-Malaga; the Aqualand in Torremolinos; and the water park in Mijas, the Aquamijas. All three have over 25 years of experience, where millions of people from the very beginning have enjoyed all their slides, picnic areas and swimming pools. “It’s a place we love to visit at least once every summer, even if times are a bit rough due to the crisis, we make an effort for the kids as they have a great day of fun”, sais Antonio Rodriguez, a family man from the town of Torre del Mar. The Aquavelis park is characterised by its family environment, compared to the other two parks on the Costa del Sol in Torremolinos and in Mijas-Costa, where the visitors are mainly foreign tourists. “we have a fantastic family water park, with a relatively small amount of attractions, where the parents come to rest on a sunbed in the grass area, with the piece of mind and tranquillity knowing that their children are having a great time and in good hands, always watched over by the lifeguard team”, sais Jose Manuel Sanchez, coordination manager of the sixty staff members in the Axarquia park. On the other hand, the Aqualand park in Torremolinos boasts of being the biggest on the Costa del Sol, with a total amount of 18 attractions for the most daring. It has 70.000 squared metres, with 40.000 full of attractions and services and 30.000 of grass and gardens. Amongst the last incorporations to be enjoyed are: the ‘Crazy Cones’, a kind of spiral and covered slide; the ‘Boomerang’, in which the visitors shoot down using a giant ring , also guaranteeing plenty of adrenaline rushes and excitement; the same as the ‘Anaconda’, ‘Twister’ and ‘Spiral’. But, only the bravest dare to slide down the great 22-metre high Kamikaze, the highest slide in Europe, in a descent that will most literally leave you “breathless”, according to the management of a resort located by the old N-340, only a few metres away from now disappeared Magic Palace in Torremolinos, on number 10, Cuba street. But, in the Torremolinos water park, that belongs to the Grupo Aspro Ocio S.L. firm and that has another 26 parks shared out all over Spain, there’s also room for relaxing and enjoying the company of wild animals such as the Sea lions, in yet another of the park’s innovations for this season. Another novelty is the multipiste, a giant slide with up to eight lanes. As for the prices, all three parks offer very similar rates, that come up to around twenty euros. 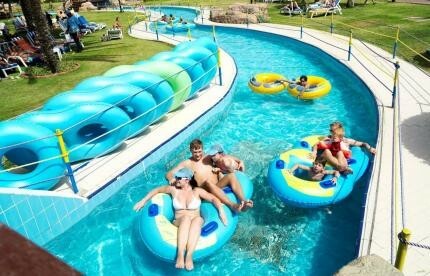 The Aquavelis park costs 21 euros for adults and 15.5 for kids from 4 to 12. In Aqualand, the adults pay 25 euros and the kids from 3 to 12 pay 18. Lastly, the Aquamijas costs 20 euros for the adults and 13.5 euros for the kids from 3 to 12. The two water parks on the western side of the Costa del Sol offer discounts for purchases online, that range from 10% in Mijas-Costa to 15% in Torremolinos. The truth is that if there’s one thing that characterises these parks, is that every summer and in spite of the crisis, they still receive thousands of visitors (only the Aquavelis in Torre del Mar receives an average of a thousand people per day during the 93 days it’s open, from the 9th of june to the 9th of September), as the fun is guaranteed for the whole family, although the kids are normally the ones to leave with the fondest memories. Due to this, in all three parks there are areas specially designated for the kids, with adapted slides, shallow pools and showers and cascades where the parents can also cool off while the little ones have the time of their lives. The Mijas and Torre del Mar parks also offer, for those who miss the sea, several swimming pools with artificial waves that are set off every hour or so. In a nut shell, water, slides and plenty of fun guaranteed for the whole family.